T1 diabetes cure close as researchers devise method to repel immune cells in pancreatic islets transplant. An approach developed by Massachusetts General Hospital (MGH) researchers may provide a solution to the limitations that have kept pancreatic islet transplantation from meeting its promise as a cure for type 1 diabetes. The team found that encapsulating insulin-producing islets in gel capsules infused with a protein that repels key immune cells protected islets from attack by the recipient’s immune system without the need for immunosuppressive drugs, restoring long-term blood sugar control in mouse models. The technique was effective both for islets from unrelated mice and for islets harvested from pigs. Protecting donor islets from the recipient’s immune system is the next big hurdle toward making islet transplantation a true cure for type 1 diabetes state the team. The first was generating enough insulin-producing islets, which has been addressed by several groups using pig islets or, as announced last fall by researchers at the Harvard Stem Cell Institute, with islet cells derived from human stem cells. Now the current study provides a way to protect islets or other stem-cell-derived insulin-producing cells from being destroyed as soon as they are implanted into a diabetic individual without the need for high-intensity immunosuppression, which has its own serious side effects. While transplantation of pancreatic islets has been investigated for several decades as a treatment and potential cure for type 1 diabetes, its success has been limited. Along with the risk of rejection that accompanies all organ transplants, a risk that is even greater for cross-species transplants, donated islets are subject to the same autoimmune damage that produced diabetes in the first place. The immunosuppressive drugs used to prevent organ rejection significantly increase the risk of infections and some cancers, and they also can contribute directly to damaging the islets. Among the strategies investigated to protect transplanted islets are enclosing them in gel capsules and manipulating the immune environment around the implant. The MGH-developed approach includes aspects of both approaches. Previous research from the team demonstrated that elevated expression of a chemokine, a protein that induces the movement of other cells, called CXCL12 repels the effector T cells responsible for the rejection of foreign tissue while attracting and retaining regulatory T cells that suppress the immune response. 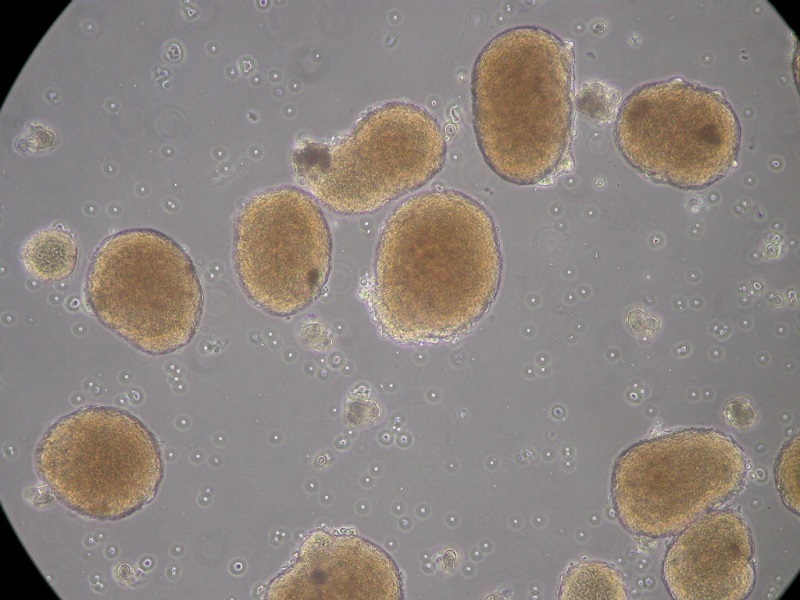 For the current study they investigated how either coating islets with CXCL12 or enclosing them in CXCL12 gel capsules would protect islets transplanted into several different mouse models. Their experiments revealed that islets from nondiabetic mice, either coated with CXCL12 or encapsulated in a CXCL12-containing gel, survived and restored long-term blood sugar control after transplantation into mice with diabetes that was either genetically determined or experimentally induced. CXCL12-encapsulated islets were even protected against rejection by recipient animals previously exposed to tissue genetically identical to that of the donor, which usually would sensitize the immune system against donor tissue. CXCL12-encapsulated pig islets successfully restored blood sugar control in diabetic mice without being rejected. The ability of CXCL12, either as a coating or encapsulating gel, to repel effector T cells and attract regulatory T cells was also confirmed. The team summise that while studying this procedure in larger animals is an essential next step, which is currently underway with the support of the Juvenile Diabetes Research Foundation, they expect that this relatively simple procedure could be readily translatable into clinical practice when combined with technologies such as stem-cell-derived islets or other insulin-producing cells and advanced encapsulation devices. The researchers foresee that CXCL12 will have a role in protecting other transplanted organs, tissues and cells as well as implantable devices, a possibility they are actively investigating. Representative density gradient purified mouse islets obtained using VitaCyte’s purified tissue dissociating enzymes. Image courtesy of Dr. Raghu Mirmira and Natalie Stull of the Wells Center for Pediatric Research, Basic Diabetes Research Group at Indiana University School of Medicine.